I’ve had my Zen float tent well over 6 months now and I thought I would review my experience with the tent. Plus, I’ve had some questions about being a tent owner and will answer those. Feel free to ask me any questions! Either comment below or contact me. I found the float tent very easy to setup. The guide was easy to follow and I was adding water and Epsom salt before I knew it. You must be certain where you place the tent is where you plan on keeping it. Moving the tent would be very difficult. I setup mine in the basement. If there were ever a leak it would go right into a drain. The day to day maintenance of the tent is pretty straight forward. I just top off the water every now and then and add some epsom salt. My water is hard and I have to add the pH down occasionally. I do use a activated carbon filter like the TastePURE Water Filter with Flexible Hose Protector. I am hoping to add a sediment filter at some point, I think that will remove a lot of the minerals that are affecting the pH the water. To keep the surface of the water clean I let the Blue Devil Scum Buddy float, it absorbs body oils. I just rinse it out and return it to the tank. The filter that comes with the tent is easy to use. I unhook it, and rinse it out, dry it and put it back. I replace it every few months. I have experimented with activated charcoal, I pour some aquarium grade activated carbon into the filter. It really does seem to keep the water clearer. I’ve not researched if it is appropriate to use activated charcoal with the high concentration of epsom salt, but it seems to work and I can’t image that it will cause any issues as long as it doesn’t end up going thru the pump. I have had the pump stop working a couple of times. I just had to disassemble the back and remove hair. I have long hair and it does get stuck in the pump. It is pretty simple to remove, however, I believe the new pumps have a pre-filter to prevent this from happening. Hydrogen peroxide is also recommended. Apparently it has a synergistic effect with the ultraviolet light. I’ve yet to order the concentrated hydrogen peroxide. I just pour a few ounces of the drug store variety in after each float. I did have the water get cloudy and the tent had a slight odor when I hadn’t used the tent in awhile (I had not be vigilant about checking the water for awhile either). I poured some hydrogen peroxide and checked back the next day. It still had the odor and cloudiness. So, I put 2 tablespoons of the My Salt Pool Chlorine-Free Shock Oxidizer in the water. The next day the water was clear and the air in the tent smelled fresh. This product is not specifically for this purpose, we use it in our above ground salt water pool. I’m not recommending you do this, but it worked well for me and does not seem to be a harmful product. I still waited a few days before using the tent. This will probably vary greatly due to usage and location of the tent. I have found the electrical cost for me to vary between about $20 a month in the summer and $40 a month in the winter. My tent is in my basement and it can be about 55 degrees down there in the winter. I pay between 7 and 8 cents per kilowatt hour. Be sure to consider the cost of your electricity when calculating your potential cost. Is the tent good for a float business? I don’t think the tent would be good for a float business. I do think it would be great for a small group of friends to pool together and share one. The pump and filter are not powerful enough for a tent that would get used frequently. 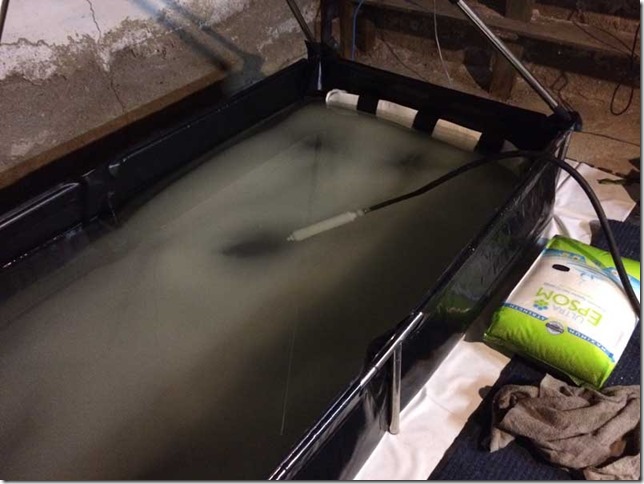 I believe, it takes several hours after a float to fully clean the tank with the pump. (correct me if I am wrong). Plus, there may be local regulations about water related business (same regulations that would apply to pools and spas) and I don’t know if the tent could meet some rigorous standards. For home use I consider it perfectly safe and sanitary. I just don’t think it would be ideal for more that a few people to be using it on a regular basis. How did you get all that salt to your house? I ordered 1000 pounds of epsom salt from Salt Works. 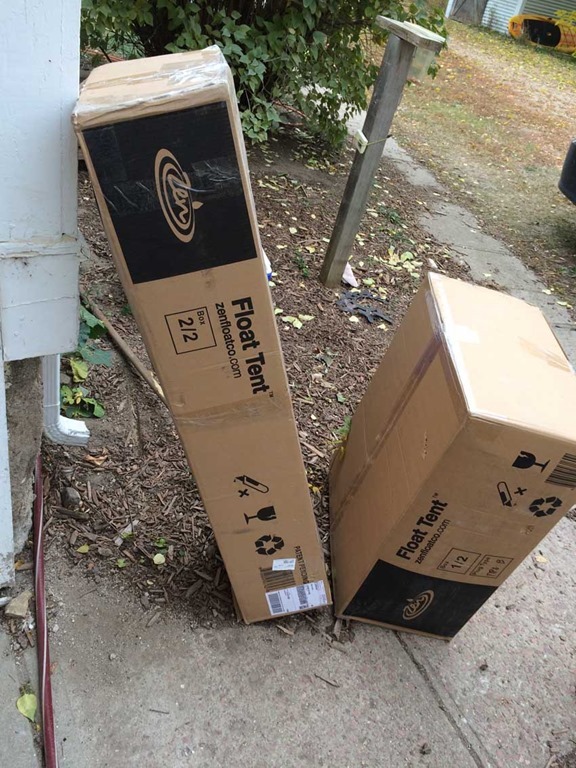 They offered free shipping and semi truck delivered it to my house. Keep in mind, you have to unload the twenty 50 pound bags when the truck arrives. Also, order some extra. You will be adding salt back in from time to time as the tank needs it. I ordered the medium grain and it seems to work well. The fine grain is probably best avoided because exposure to moisture can turn it into a solid block. The Zen Float Tent is really amazing. You can float at home for an affordable price. But, it is tent so consider where you place the tent to ensure a great float. Simple steps can reduce noise and condensation. I noticed a lot of condensation when I first started floating in my tent. I would have several drops of water hit me during my float. This is in large part due to the location of my tent, in the basement where the average temperature is 60 degrees. It would only make sense that the warm moist air in the tent would condense. I didn’t want to relocate my tent and I don’t have a separate heating zone for the basement. I went to the hardware store and got a few rolls of Reflectix BP24025 24-Inch by 25-Feet Bubble Pack Insulation. and created a shell for the tent. I was careful to ensure there is still ample air flow to the vents. This really reduced the condensation. And, I imaged it reduces the heating costs. Now, I shake the sides of the tent before a float, to remove any drops of liquid. Rarely, do I have a drop hit me during a float. Ideally, the tent should be located in a room that is 70 degrees or warmer. If you can’t do that I think insulating works very well. The tent is not sound proof. I tried to locate it in the quietest part of my house. The basement works pretty well, I can still hear when a freezer kicks on or the boiler starts to cycle. SoundBot® SB517 Extreme Bluetooth Wireless Speaker. I tried to put the speaker in the tent with me, but it has a flashing light and I image the Epsom salt could be hard on it. I now place it on the tent, roughly over where my head will be opposite the door. Then I use the Bluetooth function and play the track Brown Noise For Sleep. I find this track perfect. It is over one hour long, so I don’t notice any looping. Plus, I compare the noise to a waterfall and it blocks out the mechanical noises from my house. I have four children, so I still try to float early in the morning or late at night when they are sleeping. The brown noise does not cover loud footsteps and thumps. Overall, I love my tent. I could see Zen offering a insulated tent at some point. The thicker tent could reduce noise and heat loss. For now the foil bubble wrap seems to work great for me. Can floating make you nauseous? 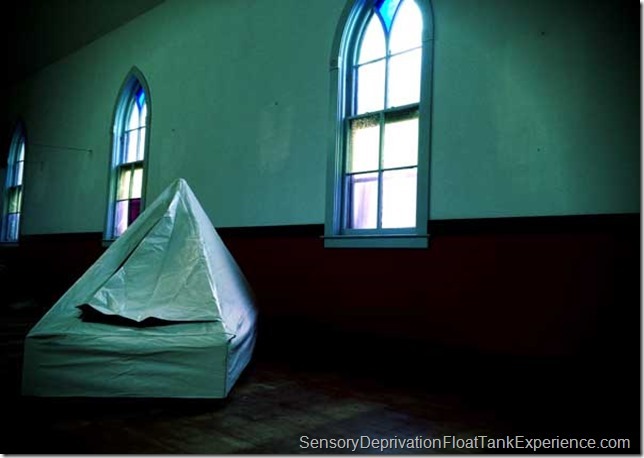 Is nausea a common experience in the float tank? From what I’ve read nausea is not very common during a float. I experienced nausea during my first four floats. The nausea came on slowly during the float. I think my second float was the worst. I nearly got out of the tank. Obviously, you should get out to the tank if you feel like you are going to get sick, you don’t want to ruin the water. I just focused on my breath and the nausea was tolerable. The nausea quickly went away when I got out of the tank. I’m not sure what causes the nausea. Maybe the disorientating feeling one can have in the tank? I’m not prone to car sickness, so I don’t think it is that. Maybe it has to do will magnesium, the electrolyte changes from the magnesium being absorbed by the skin? Either way, it doesn’t matter to me anymore. 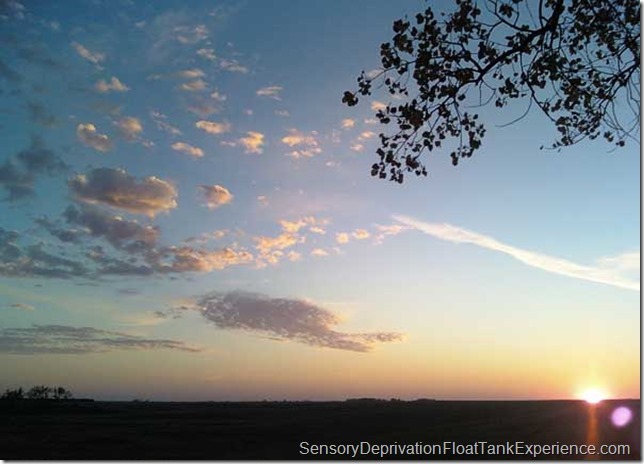 I float frequently and have not had any nausea since my initial floats. It doesn’t seem to be very common. I wonder if taking a couple of ginger capsules before getting in the tank could prevent it? Have you gotten nauseous in the float tank? How did you deal with it? Last night I fell asleep in my Float Tent. I’ve heard of people sleeping in the tank before, but this is the first time I have. I’d had a long day at work and was very tired. I felt like I was still too wound-up to fall asleep, I had a small glass of wine and still didn’t feel relaxed. So, I decided to float. It is not recommend that people float after consuming alcohol. Most of my floats tend to be just under one hour, so that’s what I was expecting. I quickly relaxed and felt my brain go into defrag mode. That is how I explain the feeling of my mind in the tank/tent. My thoughts kind of feel like they are flickering on and off – almost a strobe effect (I suspect it is when Theta waves are dominate in my brain). I image my mind filing and organizing all my experiences from the day. Defragging my brain, getting it organized. I quickly drifted off, I felt myself jolt awake a few times. Like when you are dreaming and shake yourself awake. But, it is different in the tank. When I jolt awake it is like I wasn’t totally in my body – I sort of have the experience of me slowly sinking back in the body (if that makes any sense). I find it difficult to fully put into words what happens in the tank. I was in there two hours, but if felt like about 20 minutes. Nothing always happens in the tank. And, in today’s world nothing never happens. We are a constantly plugged in and rarely do we get a chance to be away from everything. I’ve yet to experience anything that could remotely be described a psychedelic, but I have a calm focus that seems to persist for days after a float. My life seem to flow just a bit easier, maybe I don’t try and fight what happens in my day? I don’t see the float tank as a replacement for sleep, but I feel it increase the quality of my sleep. On nights I float before sleeping, I tend to remember more of my dreams and feel more rested upon waking. 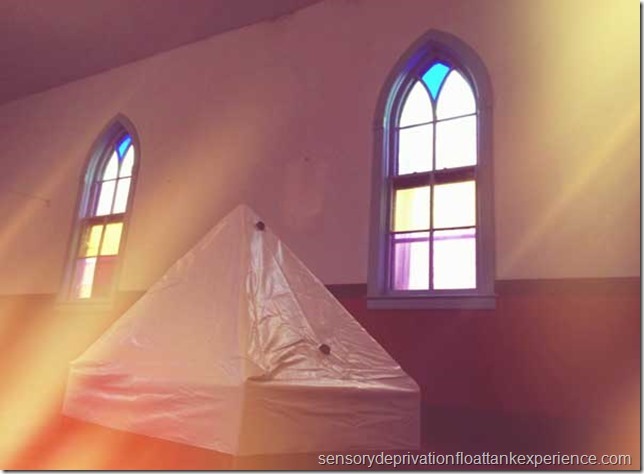 Have you slept in a float tank/float tent? What did you think about it? I’d love to hear about it. I’d have to say the most exciting park of setting up my float tent was filling it with water and adding the Epsom Salt. 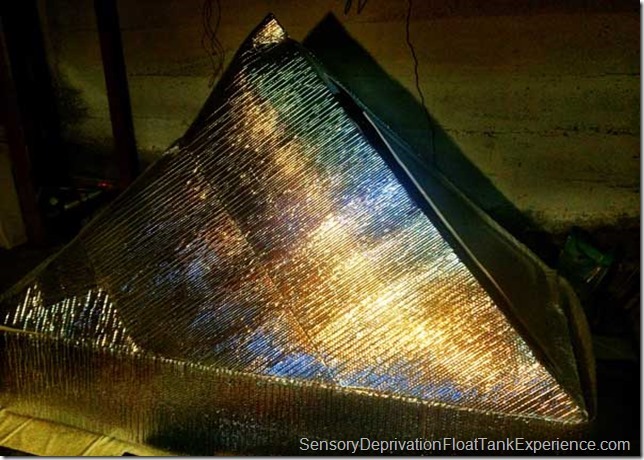 I’d had a thousand pounds of Epsom salt sitting in the basement for two months, waiting for my float tent. The moment was finally here. It took nearly 48 hours for the salt to completely dissolve. I would occasionally agitate the salt, but it takes awhile to fully dissolve. It is worth the wait. It is a treat to have a float space in the basement. I feel I carry less tension in my muscles now. It may be due the magnesium or the floating. Or, a combination of both. I think floating regularly is really going to reduce my baseline level of stress and allow me to be more present in life. I’ve always had an interest in exploring my subconscious mind. Blocking everything out except for my thoughts and diving deep into them. Plus, rarely do I every feel completely rested. Between work, family and technology I feel like I never completely relax. I’d heard of sensory deprivation tanks, but didn’t even consider having one of my own. A couple of years ago I started to hear about them again. I’d don’t live near a metro area with a float center, so I decided I was going to build by own. I just knew it was something that would serve me well. During my research, I learned of the float tent. It made floating at home affordable. And, it is even cheaper than building your own. I decided I have to have one. I bought one of the first ten tents when Zen Float when live on Kick Starter. 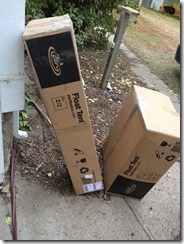 And, yesterday it showed up at my house. Right now in my basement, the water is heating and 800 pounds of Epsom Salt is slowly dissolving. I imagine I will have my first home float in the next day or two. I put together this blog to share my experience of floating. 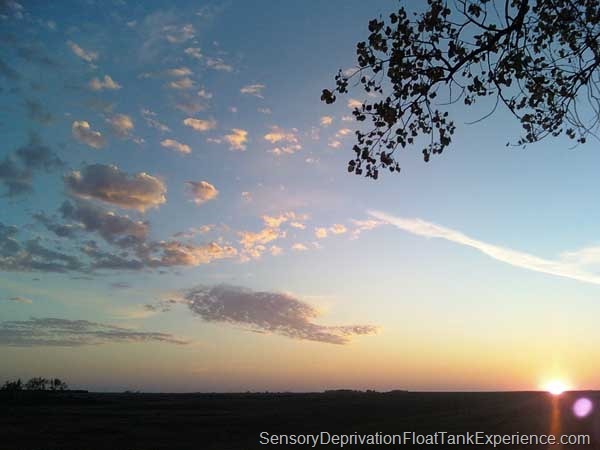 I plan to share what I learn about home floating and anything else float related I find. Enjoy! Feel free to ask me questions in the comments or the contact page.